Toshiba has announced the highest-capacity twin platter laptop hard drive in the world at 750GB, as well as a 1TB, three-platter laptop drive. The two-platter model fits in a standard 9.5mm z-height notebook drive bay whereas the 12.5mm x-height three-platter drive does not. Both drives spin at 5400rpm - 200rpm faster than WD's SCorpio Blue laptop drives, which come in at 640GB for the two-platter model and 1TB for a three-platter version. Seagate has a 640GB Momentus 5400.7 two-platter drive in this form-factor. Toshiba has upped its areal density to 541.4Gbit/sq in for its MK7559GSXP 2-platter drive, a slight increase from its previous 640GB two-platter drive's 528.5Gbit/sq in. Both new drives use the 3Gbit/s SATA II interface and have 8MB caches. We can expect WD to bring out a 750GB SCorpio Blue two-platter, 2.5-inch drive and Seagate to announce a Momentus 5400.8 two-platter model also at the 750GB level in the coming weeks or months, as this is a hotly-contested sector of the drive market. Hitachi GST is lagging as its highest-capacity Travelstar 7K500 drive is 500GB, but it does spin at a faster 7,200rpm. We might expect some announcement action from Hitachi GST in the notebook hard drive sector, especially as Seagate's Momentus 7200 matches its 500GB capacity and Seagate is busy introducing 10K and 15K SAS 6Gbit/s notebook drives, meaning Hitachi GST is getting left behind. 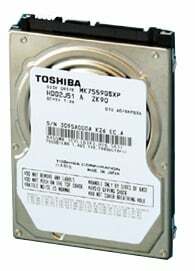 Toshiba has a range of 1.8-inch drives which top out at 320GB with two platters, having an areal density of 516Gbit/sq in. Were the company to apply its 541.4Gbit/sq in technology here then capacities could rise towards 340GB - not much of an increase really.